I haven’t spoken much about my boonie peppers this year, perhaps because they sprouted and grew, but not spectacularly. I didn’t fertilize them much after the spring, because I wanted flowers, of which I saw not a one all this year. 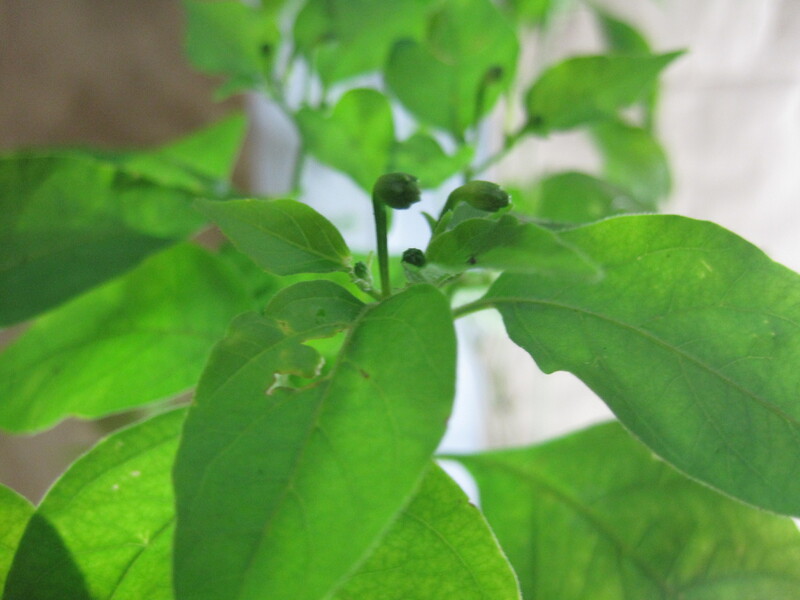 But I just took them inside, after the recent freeze, and within one day after taking them inside, every last boonie pepper now has flower buds. If I had to guess, it was a temperature thing. The summer was too hot, and the fall too cool to trigger any flowering. 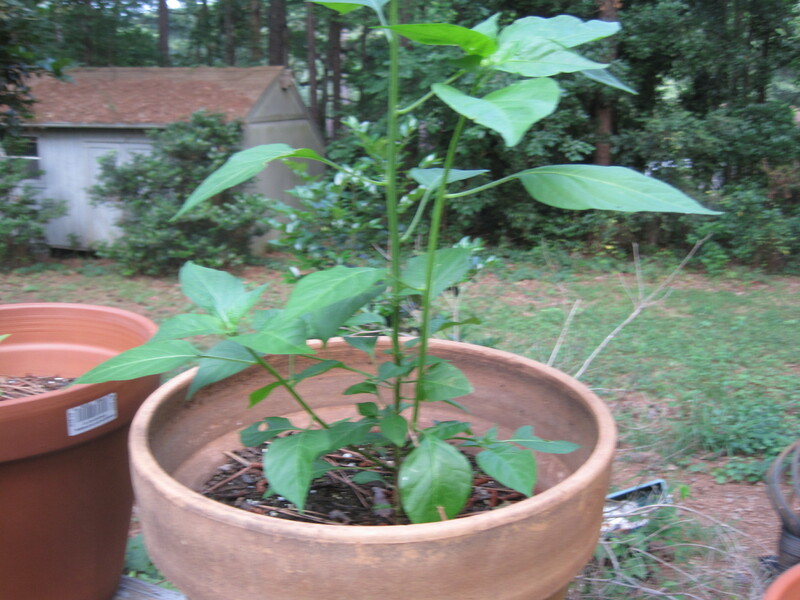 It suggests next time taking the plants inside earlier, to trigger the growth of peppers. Update: the lighting tools we’re using to grow peppers inside are described here and here. 4 desk lamps with grow bulbs as described in the links are being kept on a 16 hour cycle. It’s a blessed mess of green back there. 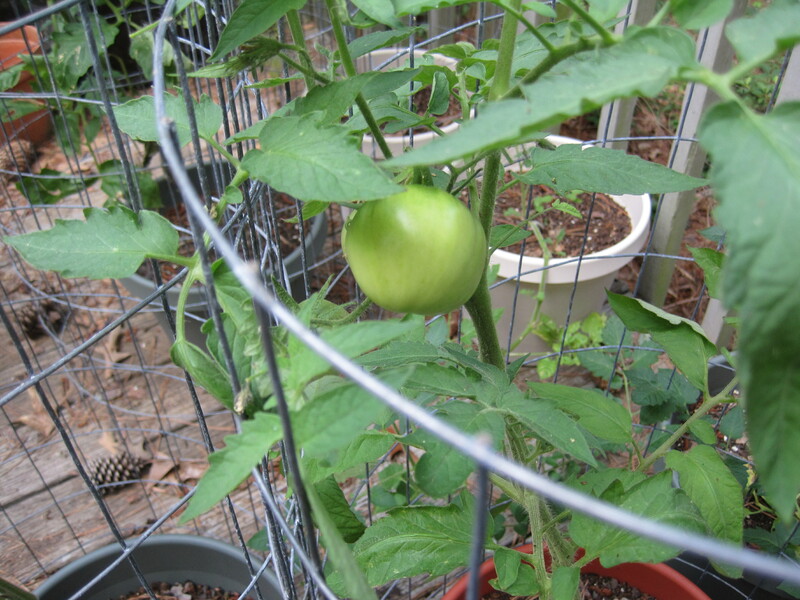 I’ve been moving some of the twistier tomatoes to beside the chain link fence, to see if they’ll grow into it. 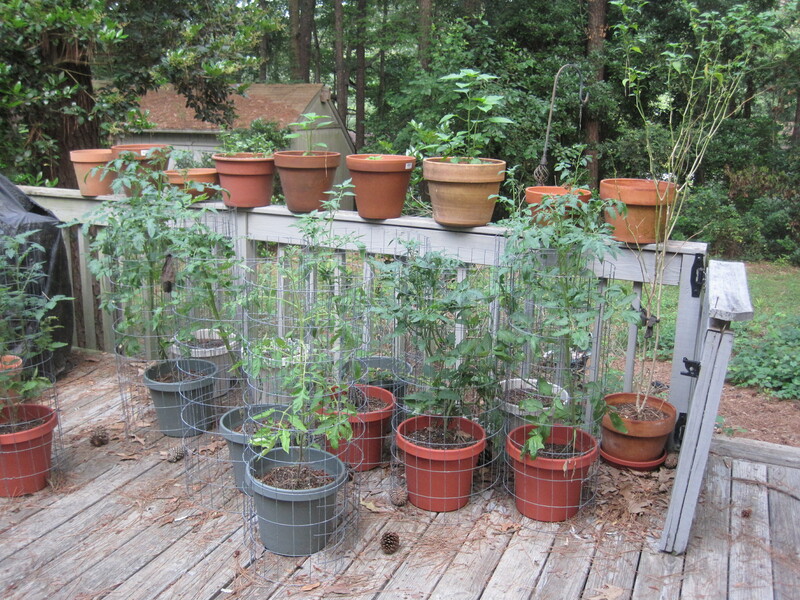 11 tomatoes still sit on the deck. Some of them even have fruits. I had four boonies sprout, of which one died, one was cut off by some worm before it could get anywhere (still alive though), and the other two look pretty healthy. This photo is of the best of the new year’s boonie peppers. I don’t expect any crop until late fall. 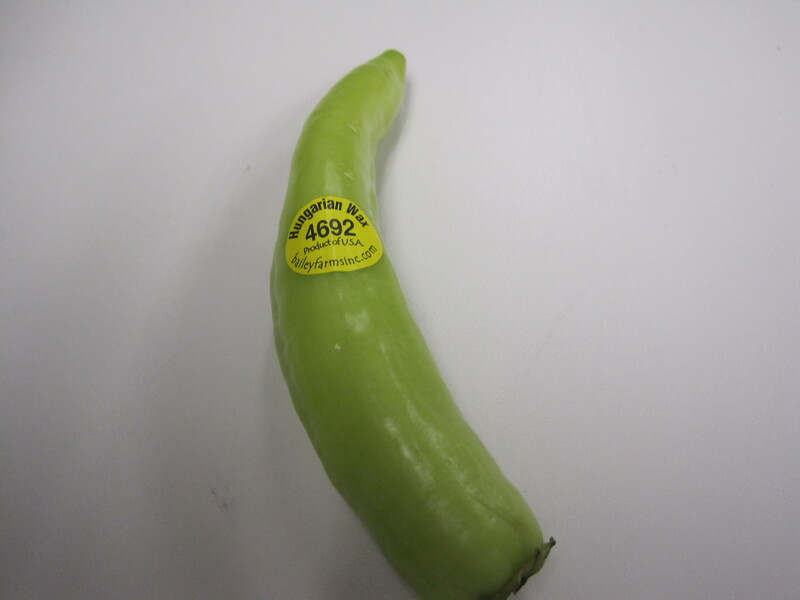 It’s a pretty yellow pepper, perhaps 3-4 inches long. In the market they look like banana peppers, though they’re considerably spicier. 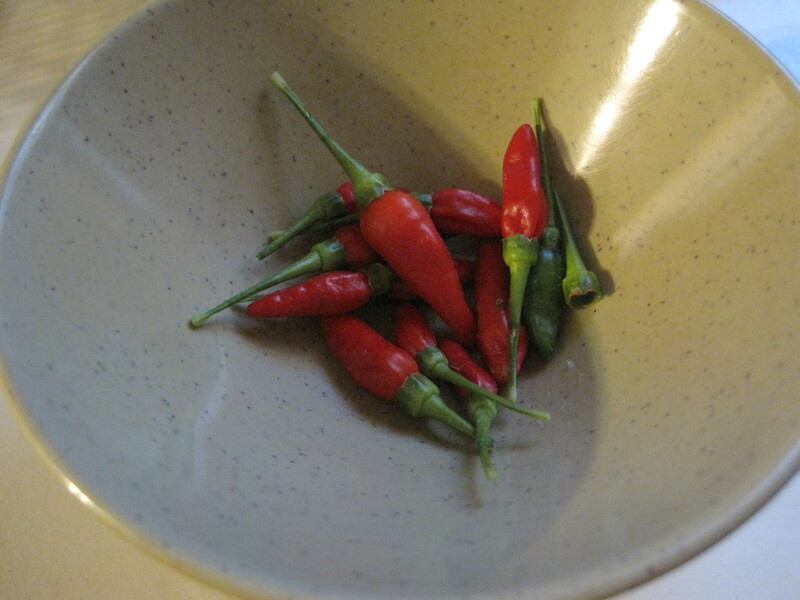 The Hungarian Wax pepper is what they make paprika from. I had one recently, buying it from the local Publix. It has a kick to it. It made me happy I had bought some extra baby spinach for my lunch. That and an additional slice of bread made the pepper more tolerable. I should note the heat of the Hungarian Wax is about that of the jalapeño. That’s about as much heat as I can eat straight, and I’ll need some starch to help sop up the fire. I marvel at how my tropical pepper, the Guam Boonie, continues to produce when the weather is so cold. My boonie peppers are inside these days, the weather became too cold to leave them outside. They showed a lot of sensitivity to temperatures below 40 degrees F ( 4.4 C) and were wilting. When the weather warmed up to 50 degrees F the leaves began to recover. We only needed to see one day of that to bring the plants inside. I didn’t need my boonies to die in the freeze. I’ll note the peppers look different from pepper pilot seeds as compared to the seeds from floralys (see my original article on boonies here). Pepper pilot peppers are a dark green, while the floralys peppers have the light yellow shade of banana peppers. Eventually they’re all supposed to turn red in the end, but it is interesting, noting the color variation between two different vendors. Getting as many of these Guam boonie peppers as I can has been a many months campaign. Right now I have one. Other plants aren’t mature enough yet. I may have to winter all of them inside and cross fingers they survive until next year. What I don’t know is whether these structures on my plants are flowers or tiny compacted leaves. Benny’s (Snellville) in pictures, and thoughts on spicing a Cajun dish. A proper etouffee will be orange-colored, with a hint of brown. It should be spicy, as it’s main spice ingredient is cayenne pepper, and saucy enough to form a thick gravy for the rice. However, take note that it is not gumbo, and should not be served like soup. The gravy in etouffee is much thicker than the roux of a gumbo. you have to ask just what people are thinking when they serve underspiced food. Anyway, I needed something to remind me of what serious spicing is all about, so a visit to Benny’s was truly in order. Mike “Benny” Miller, for better or worse, has the spicing of his food down cold. The sign may be the first thing you see. Guinness - lighter in taste than the color suggests. Then a bowl of Benny’s excellent gumbo. The gumbo has flavor that builds with every bite. The entree was Benny’s excellent jerk spiced pork tenderloin. Rich with flavor. Somewhere around here I'm finishing my 2nd Guinness. The dessert was a pair of Key Lime sticks. I’m sure the dessert was overkill. Worth every minute of exercise they'll cost. The restaurant was pleasantly full, with a church group meeting inside. I was able to speak to Mike a bit, all much appreciated. He’s a gracious host, knows food far better than I ever will. His theory on heat is to get the hottest pepper possible, and then add ingredients that add flavor (shallots, garlic, etc). Flavor, to Mike Miller, is more important than pure ‘burn’.